High quality wealth management for everyone. We’re on a mission to democratise wealth management. Our experts build and manage sophisticated global investment portfolios designed to help grow your wealth and reach your goals. We use technology to give you a world-class service that keeps costs and charges low to boost your returns. So - whether you’re starting with £5m or £500 - welcome to the UK’s largest*, and fastest growing** digital wealth management service. close on the 5th April at 23:59 (the period between 2(a) and (b) is the Offer Period). on more than one eligible Nutmeg product. Fund your new Nutmeg ISA, General Investment Account or Pension by making a minimum initial investment of £500. 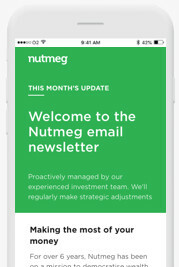 The Promotional Fee Rate will be applied within one (1) month of the funds in the new Nutmeg customer’s account first being traded (“First Traded Date”). Please note that if you decide to open your account through the 100%-cash-pot option, the Promotional Fee Rate will be applied within one (1) month of the funds in the new Nutmeg customer’s account first being contributed (“First Contributed Date”). After a period of six (6) months the standard Nutmeg management fees will be applied. Details available here.